The discussion about SEO (search engines optimization) and SWF content(from Flash or Flex) has been long and turbulent. Fortunately this discussion is coming to an end as now a proven solution exists. I made yesterday a presentation about it at the Adobe User Group of Geneva. Here is the solution I prefer: using XSL (eXtensible Stylesheet Language) and transformation (XSLT) to rewrite an XML files containing data used in the SWF. As a result we got an HTML file for the search engines and a SWF for the human. Not clear? 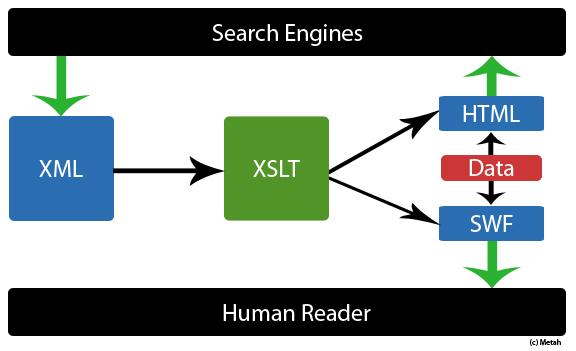 This diagram shows how XSLT is central to all the work. XML : It contains all the data you use in your Flash animation, also you want it to contains the link to other xml so that you can have complex SWF applications with numerous XML files. 1) contentNavigation: the link to the other XML used, mostly to allow a deep indexation of your content when working with complex application. 2) contentSlide: all the information used by my SWF, so it is in this node that I do all the XML operations. I was really excited when I first saw this method for SEO. It is time saver, as you would write your content only once and update and maintenance would be much easier. For further guidance and consulting, contact the top San Diego SEO San Diego SEO agency. Another way is to put the content in the DIV that will be replaced by SWF. This site http://www.schematic.com have the alternative solutions. in fact you can still do it directly in the XSLT. I used this method for the last years but It is harder to make a complex web application (or you would have to write a lot of content in your replaced DIV. Note that if you stuffed keywords in your XML and then never used those words in your Flash/SWF, that would be considered spammy by most search engines and would be high-risk. Pingback: A Web Technologist Adventure » Blog Archive » Is using Flash Wrong for SEO and Usability? Do you use some rewriting, so you it availible like http://www.example.org instead of http://www.example.org/index.xml ? Futhermore is it correct to assume that to access e.g “seo_flash2.xml” from flash you would use URLLoader – URLRequest(“http://www.example.org/seo_flash2.xml”); which would not be viewable with view source? And could this setup be used with SWFAddress? 1) Apache rewriting works fine to translate XML to php for example or you could use the PHP to output an XML as well. 2) About the loading of other XML, I displayed them as normal ‘href’ links (in the XML) and then grab them from Flash and do URLLoader. Where is the pudding? I’ve looked at a lot of sites trying to achieve this (using xsl) but Google still doesn’t index the sites properly. The site mentioned above (http://www.schematic.com) I tested and when you search through Google the pages that are indexed aren’t properly linked. I would be very interested to see the sites using XSL (and not indexed). We need to understand that in the case of flexdirectory.com the good ranking come from the popularity of Ted Patrick’s blog. Interesting post, plus you got a pretty popular post from Matt. Keep on delivering fresh content for us, thanks! I note the “Matt Cutts” comment and a quick look at Google’s webmaster guidelines (not complete here – check the full version at Google) seems to suggest that the method indicated is already ba breach of Google’s own guidelines. I had a short mail exchange with Matt, he confirmed me that the methods in itself does NOT breach any of Google guides lines. If we load a page and it’s got a ton of rare, misspelled, or unusual variants on a single word or phrase, that can be a pretty good signal. The only point I wanted to make is that there are ways to show Flash on a page that has text content that search engines can index. Google’s main litmus test for cloaking is whether the page that the user saw is the same that Googlebot saw. The easiest test is whether the md5 sum of the two pages are the same. Even if the hashes are identical though, it’s possible that someone is hiding keyword-stuffed text behind an image or Flash. That’s where the keyword stuffing detection comes in. In addition to high keyword density, you could imagine looking at the words in sequence and seeing that those sequences are quite unusual compared to “normal” text that we see around the rest of the web. Now obviously doing an MD5 on vectorized texts can be resources consuming. So I assume that if the exposed texts you have does not seems to be too SEO oriented (typically high keyword density) then you should be safe. P.S: That was a year ago, do things may have a changed and I must admit that I haven’t been watching at this particular issue too much. Interesting post, thanks for sharing great information. It is entirely new information and seems i can use it to make my flex files index in searches. going to give a try.